This Song Will Save Your Life by Leila Sales. Grades 7 and up. Farrar, Strauss, & Giroux, September 2013. 276 pages. Reviewed from ARC provided by publisher. No one likes Elise Dembowski. Truly, she has no friends, and when an entire summer spent studying up on the coolest clothes, the hottest bands, the popular TV shows does nothing to help her make friends, Elise decides enough is enough. But her foiled suicide attempt doesn't get her the attention she was hoping it would, and still nothing changes for Elise until she stumbles on an underground dance party during one of her nightly walks. And suddenly Elise meets some people who might accept her for who she is. She's not Elise Dembowski anymore, but DJ Elise, and that changes everything. With a darkly humorous tone, Leila Sales spins a story about finding your path and staying true to yourself. It's a theme that's not uncommon in YA lit, but it stands out because Elise felt so real. Elise is so awkward that it's painful at times, and she knows it. She's mercilessly bullied by the other kids at school and she really has no idea how to make friends. There were times I wanted to shake her, but at the same time I wanted to take her by the hand and find her a tribe to belong to. The music element was nicely done and I felt like I was standing in the DJ booth with Elise as she was working the crowd. Song lyrics start each chapter and they'll make a heckuva playlist, for sure. This is an element that teens will identify strongly with - those songs that speak to you and your experience - and it rings true for Elise's teen experience, too. I've loved Leila Sales's realistic teen characters in her other novels (Mostly Good Girls and Past Perfect) and I love TSWSYL, too. For another tale of the importance of music (and DJing! ), pick up Beautiful Music for Ugly Children by Kristin Cronn-Miller. This story of a transgender boy who comes to life at his weekly radio show is more intense than TSWSYL but sends the same message - it's okay to be who you are (and also music is awesome). Another story with a somewhat unlikeable (but ultimately endearing) very unpopular protagonist is The Murder of Bindy Mackenzie by Jaclyn Moriarty. If Elise's awkwardness and friendlessness is something that strikes a chord with readers, this one might be a good choice. 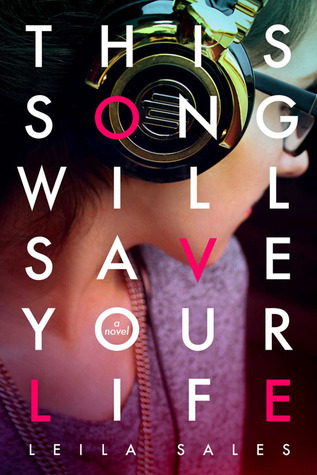 This Song Will Save Your Life will be on shelves September 17!